It was just after 6 a.m. when the first arrest was made. Police in riot gear first detained union leader Josh Brahinsky. An hour later, 19 more students — 13 undergraduates and six graduate students — were handcuffed and escorted to Santa Cruz County Jail for allegedly blocking roads and UC Santa Cruz’s West entrance. They were also arrested for disobeying police and continuing to riot. In addition to the three misdemeanors and one infraction, Brahinskywas charged with resisting arrest. UCSC police Chief Nader Oweis said the police force, comprised of UCSC, UC Berkeley and UC San Francisco police officers, gave each of the 20 individuals a warning prior to the arrests. Despite arrests early in the morning, the number of strikers increased throughout the day, with 50 people present at the East entrance around 10 a.m., growing to around 150 in the early afternoon. “The irony is we’re striking over the intimidation of workers and the university comes out with riot cops. That’s sad as a response to unionized protest,” said graduate TA Jeb Purucker. 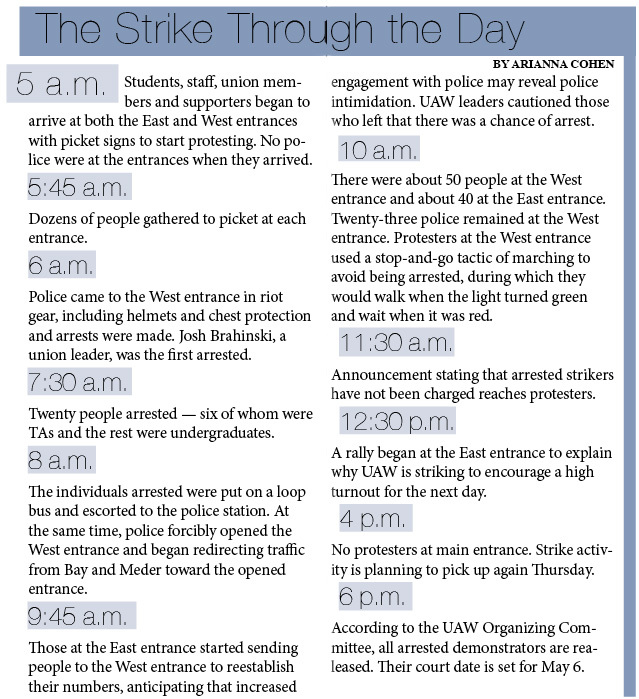 According to the union’s press release, the strike was sparked by a comment made by the UCSC’s writing program director James A. Wilson, who allegedly told a group of graduate union members that if they joined the strike, they would be denied membership to his program the following year. As a result, the workers’ union filed an Unfair Labor Practice charge against the university. However, many student and faculty supporters present at the April 2 protest said this is only the most recent in a series of intimidation tactics by the university. Union member and graduate student Brian Malone said his biggest grievance is the way in which the UC disrespects the basic rights of UAW members. “We’re striking statewide because of patterns of intimidation, threatening with arrests, threatening international students with the loss of their visa and threatening our members with firing,” Malone said. The union enjoyed some brief victories, including an announced protest on March 4. According to a press release, the UAW and UCSC reached an agreement at the last second over two grievances — undergraduate TA pay and benefits under an excessive workload. Still, graduate student and union member Jeb Purucker said there is a pattern of illegal behavior by the UC administration occuring at every campus statewide. As a result, the union filed a charge with the university for unfair labor practices. Another charge the union pressed against the university is rooted in a strike that took place on October 29, in which UC Berkeley and UC Santa Cruz police filmed the protest of union members. According to the press release, it is unlawful for employers to film these activities. Malone said this issue was added to the list of the union’s grievances against the university. Many of the protesters, such as undergraduate supporter Nadine Brennan, said they were exhausted by the constant feeling of intimidation by the UC and the unfair treatment of graduate TAs. In addition to the previous charges filed by the union against the university, some protesters also mentioned their dissatisfaction with alleged discouragement from faculty members to strike. While previous strikes were able to block the campus entrances, Chief Oweis said the university administration felt this particular strike needed a police response — it took place at the beginning of the quarter, involved unlawful behavior and an incident involving one car being swarmed. Executive vice chancellor (EVC) Alison Galloway also said the arrests were a result of blocking vehicles. She expressed concern for campus residents impacted by the strike activity. While Chief Oweis maintained that the arrests themselves were peaceful, several sources mentioned the use of force on the protesters who were arrested, specifically through the use of tasers. One source speculated the taser sound may have stemmed from a pair of zip tie handcuffs, which was mistaken for the sound of a taser. Chief Oweis said there was no use of tasers by UC police. “I can tell you that none of the UC officers even have a taser on them,” Chief Oweis said, referring to the presence of other UC police officers including officers from UC Berkeley and UC San Francisco. EVC Galloway confirmed Chief Oweis’ statement regarding the use of tasers by UC police. She also said the strike itself is impeding a conducive learning environment by disrupting classes and normal university business. In light of the strikes, EVC Galloway said the Office of the President does not intend to go into negotiations for “a little while.” Undergraduate student Katie, who preferred to not use her last name, expressed that immediate results are not the ultimate goal of the strike.